It is hard to believe that May is already upon us. Winter has passed and early spring has brought the flowers and the rain. May brings the promise of sunshine, warmer days, a return to the garden and spring cleaning. As soon as May arrives, it feels like an internal alarm goes off inside me and I have the profound urge to clean out closets, shelves and every corner of the house. Winter has a way of causing clutter to accumulate, and spring is the chance to break free of the excess. It is energizing and liberating for me to take a few afternoons and focus on the rather mindless but wonderful task of spring cleaning. The fulfillment it brings inspires me to apply the same concept to my diet and health routine. May also brings Mother’s Day and a special acknowledgement of all those who mother and care for others. Make sure to take time to celebrate and acknowledge those individuals in your life who have mothered and cared for you; raised you up, supported you, and believed in you when perhaps you couldn’t believe in yourself. It is also a wonderful day to think of those whom we mother, whether they are our physical children, our four legged friends, people we love and care for, our creative ideas, our passions. Celebrate the qualities of nurturing and caring knowing that as we cultivate those qualities in our relationship with others, we are mirroring them within ourselves. With spring nearing full swing, people naturally want to look their best. It’s the time of year when we trade pants for shorts and oversized jackets for breezy tank tops and t-shirts. Over the course of the winter, it’s easy to lose your way with all the holiday treats and rich, hearty foods that keep you cozy on chilly days. But now that the sun is shining more prominently, it’s high time you feel 100% again. 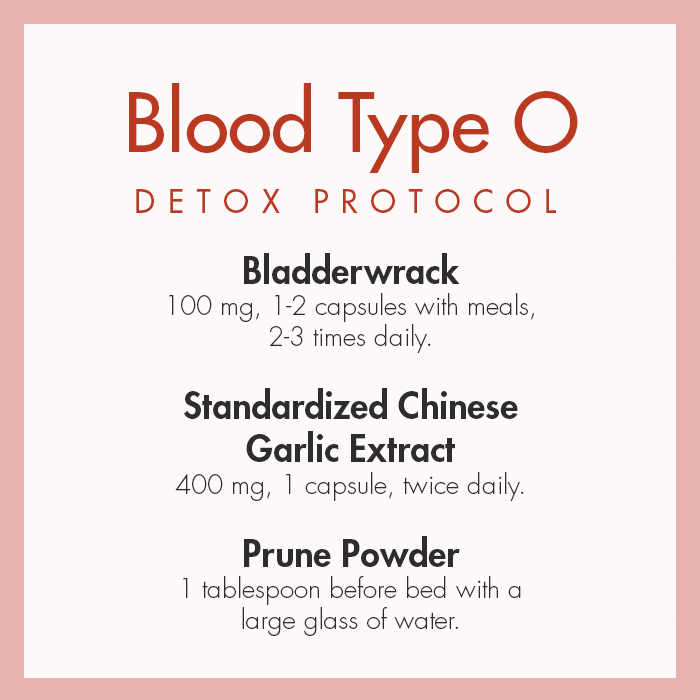 Even if you strayed into “avoid” food territory on more than one occasion, you can revive your body with a cleansing Blood Type Diet based detox program. It’s like your own personal version of spring cleaning! For a generally healthy person, I suggest a one-week program of whole, organic foods and supplements and against starting a fasting routine. Fasting is one way to detox your body, but probably not the best way. I would only suggest fasting if you are under the guidance of a physician. While entirely avoiding food will naturally flush your body of toxins, doing it without professional guidance often has negative effects. This process is simpler and much easier to follow and doesn’t carry the risks of fasting. 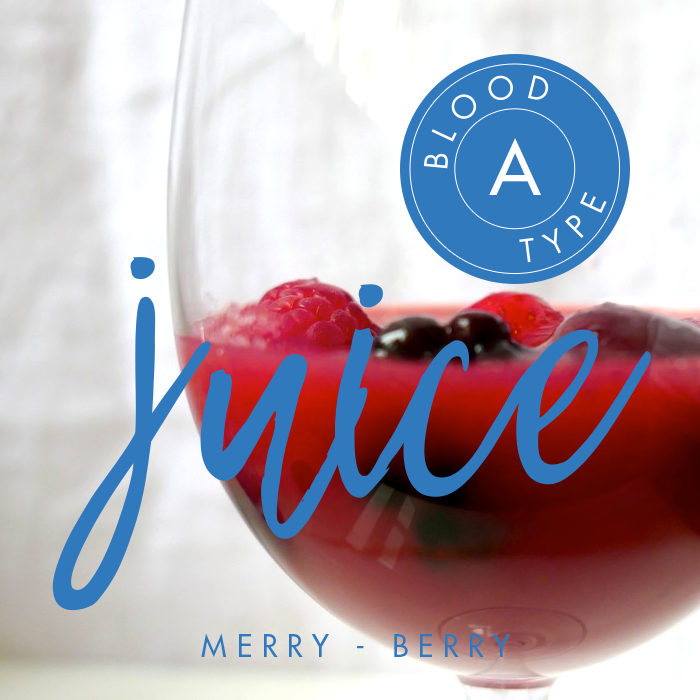 Start by choosing foods listed as beneficial and highly beneficial for your blood type. If you need some guidance on which foods are best, refer back to the 20th Anniversary edition of Eat Right 4 Your Type or the TypeBase. Both of these are newly updated with the most recent, relevant information. The Blood Type Diet app is another option, available for Apple and Android devices. Though it doesn’t have the 20th Anniversary edition updates yet, it will soon have a free update - and it’s handy when grocery shopping, eating in restaurants and meal planning. 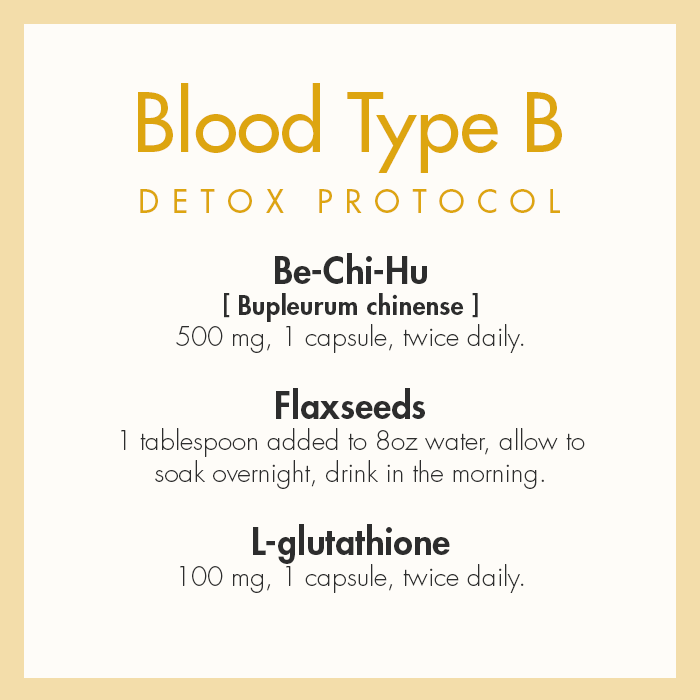 By eating beneficial foods and taking supplements that are compatible with your blood type, you will be cleansing and detoxifying your body and allowing all of its systems to function at their very best. Purchase organic when possible and stick to buying whole foods, rather than processed foods from a box, bag or can. The closer the food you buy is to its natural state, the better it is for you. Avoiding preservatives and other chemicals is paramount. Water helps with cell regeneration and plays a huge part in cleansing the body. Start the day off with a glass of lemon water and continue drinking plain water throughout the day. Aim to drink eight to ten glasses every day. To make reaching this goal easier, bring a personal water bottle with you wherever you go and know how much it holds. By quantifying your goal in relation to your own water bottle, it becomes much easier to keep track of and in turn attain your goal amount. Avoid being around harsh chemicals and steer clear of chemical cleansers – try vinegar, lemon juice and baking soda when cleaning around the house. Not only are these natural cleaners better for you, but they are better for the environment too. Get some fresh air! Take advantage of the ever-improving weather. You’ll get your blood circulating, your muscles pumping and the clean, crisp air will revive you. 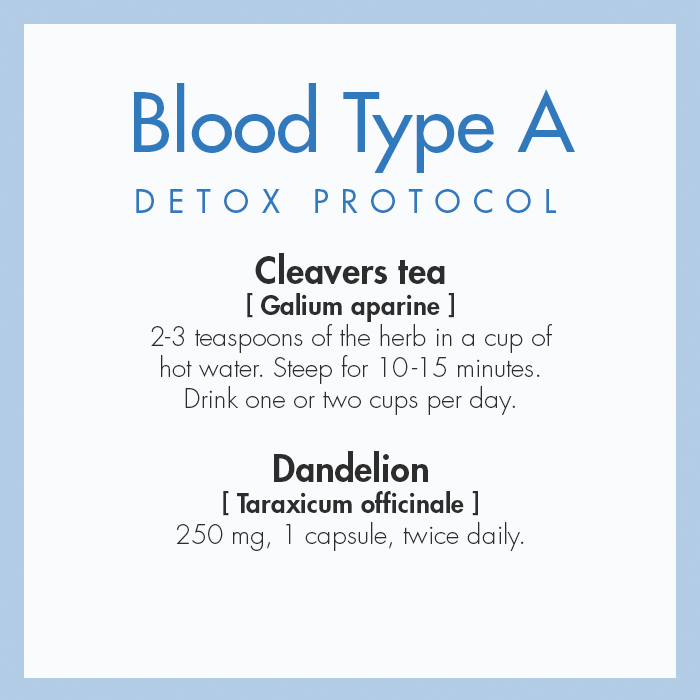 As part of your detox protocol, I recommend some herbal supplements for each blood type. Each protocol is to be done for 7 consecutive days. Dr. Peter D’Adamo knows that cleansing is a process that could use some support. Our featured products for May are some of the best to help your detoxification efforts reach fruition! Harmonia Deluxe is a great way to start your days. 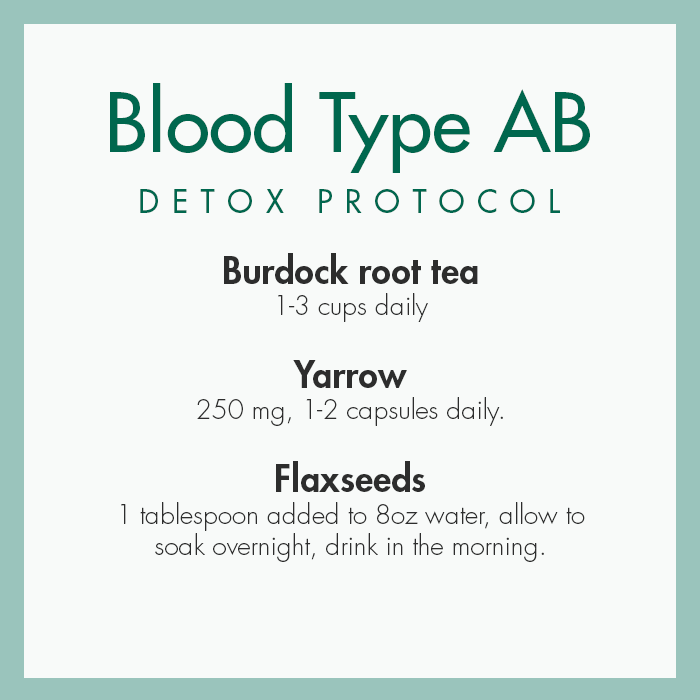 As a completely natural plant-based drink mix, it can provide you with energy and nutrients that get you on the right track as soon as you wake up. Blend it in your favorite Right 4 Your Type beverages and enjoy! Intrinsa helps to alleviate stomach discomfort and digestive problems that might disrupt the progress of your cleanse. Polyflora is a microbiome booster with probiotics and prebiotics to keep your gut health running strong, which will further ensure your stomach stays happy and healthy while you detox. It is available specialized for each blood type. Our final product of the month,Mr. Itaru’s Green Tea, is a special blend of one of the world’s most well known detoxifiers. Enjoy a hot cup or brew it iced and take it with you for a refreshing, cleansing drink you can enjoy all day! I am a 100% believer in the Blood Type Diet. 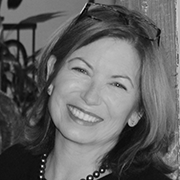 I started to examine my health more seriously after suffering from severe acne from ages 17-35. As teenage blemishes faded in others, mine raged on. I tried every cream and treatment that was recommended, but had underlying issues I didn't fully understand yet. Upon hearing about the Blood Type Diet, I found out I was Type A and began to eliminate the foods that were wrong for my type. One of the biggest culprits was oranges and their related products, like orange juice, oil and peel. After eliminating these "Avoid" items from my diet, the relentless acne that plagued me dissipated. Dermatitis on my scalp proved to be another skin issue that I was having that the Blood Type Diet fought off. 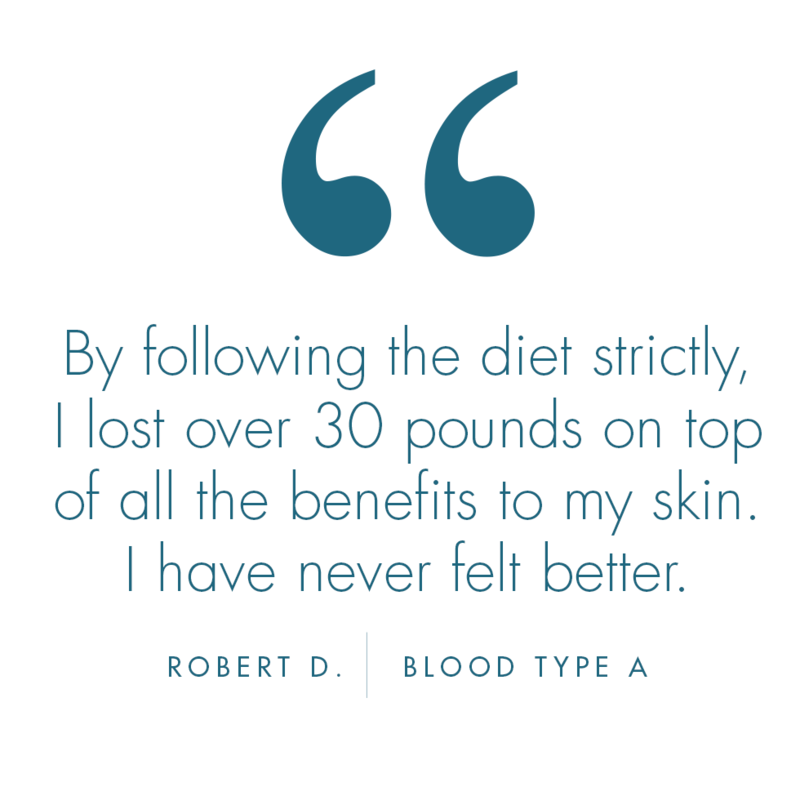 By following the diet strictly, I lost over 30 pounds on top of all the benefits to my skin. I have never felt better. My wife and children have seen my success and follow the diet as well. I will continue to spread the word to everyone I meet about the benefits of following this personalized lifestyle. Thank you Dr. Peter D'Adamo! Two representatives from Asahi TV flew all the way from Japan to interview Dr. Peter D’Adamo at the Center for Excellence in Generative Medicine located in Bridgeport, CT. They filmed the interview and we hope to share it with you as soon as it becomes available! It is tentatively planned to air in Japan early in May. A writer for MyDomaine, a website featuring lifestyle information and advice, talked with Dr. Peter D’Adamo about the basics of the Blood Type Diet with a focus on ideal meals for each type and the main foods to avoid. Blood Type Diet in Bollywood! GQ India ran a story about the Blood Type Diet and how it helps two of India’s greatest stars, Sidharth Malholtra and Akshay Kumar, stay healthy and happy! Juices and cleanses go hand in hand. Drinking homemade juice made from whole fruit and vegetables is one of the healthiest and easiest ways to get the nutrients you need to support your detoxification efforts. 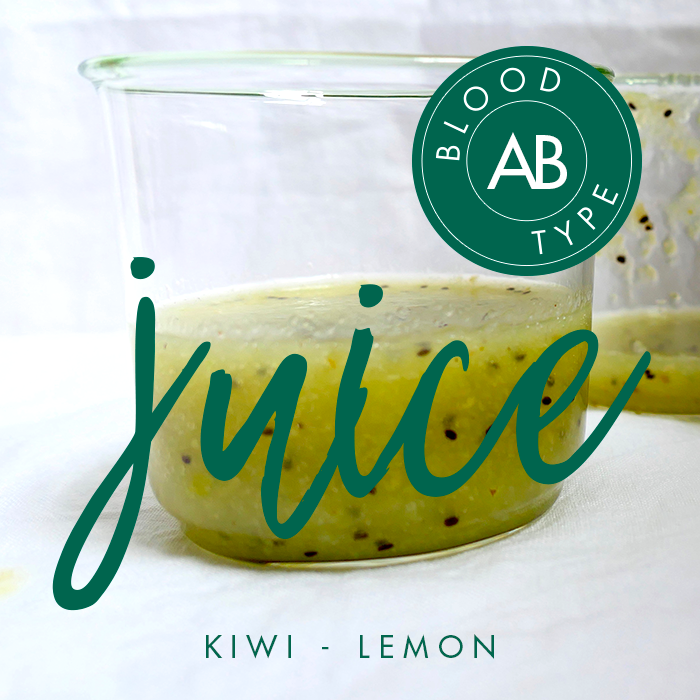 Try these recipes we made specifically for each blood type to make your spring cleanse as fruitful as possible! Peel the mango and banana and chop them roughly. In a blender, blend all the ingredients and pulse to desired consistency. Add water, a tablespoon at a time if you want the juice to be less thick. Wash all of your fruits. 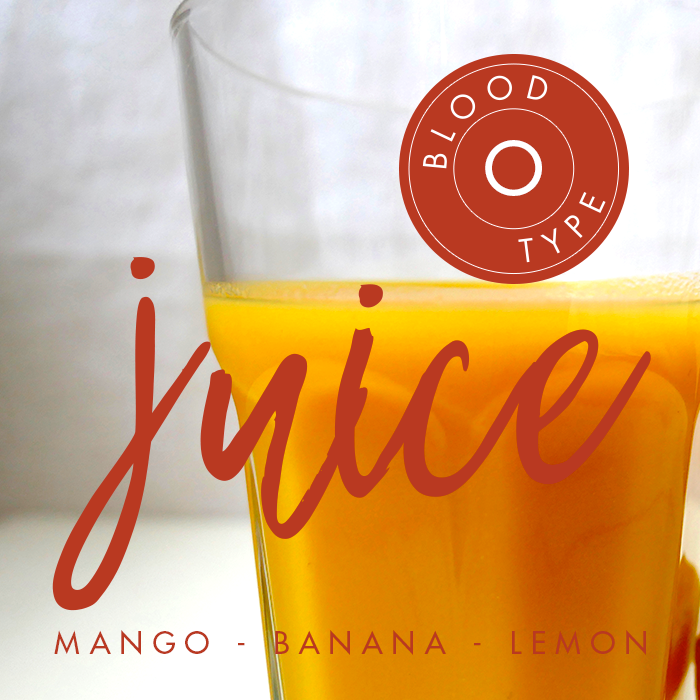 You can use a juicer for a thin consistency or a blender for a thicker consistency, depending on your preference. In a juicer, extract the red fruits and then blend with the apple and lime juices, stir well. In a blender, blitz all of the ingredients together, and enjoy fresh! Peel the papaya, cut it in half and remove the seeds with a spoon. 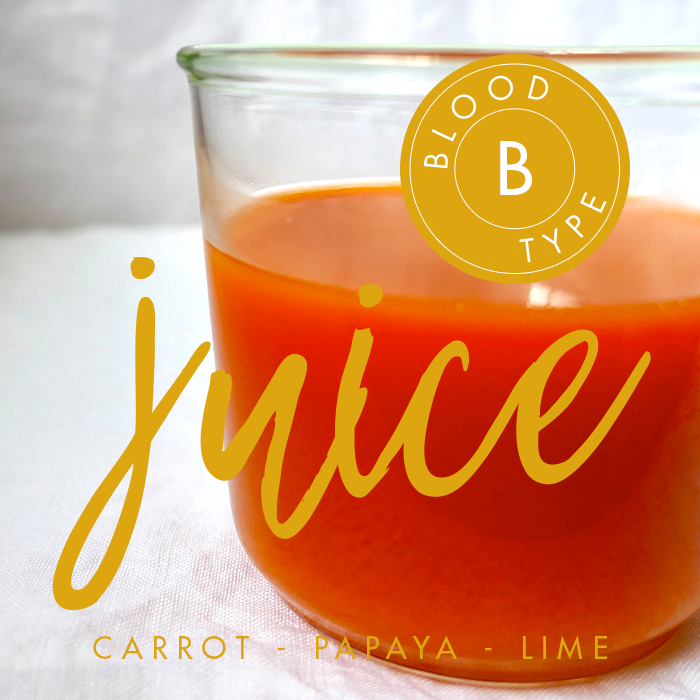 In a juicer, extract the papaya and carrots. Add the lime juice in your glass and mix well. Peel the kiwis and chop them roughly. In a blender, mix the kiwis and lemon juice until you reach your desired consistency. For a looser juice and to get rid of the kiwi seeds, strain the pulp in a clean glass.